Question: I’m a planner and I work my plan. But every once in a while things don’t go according to plan and I don’t handle it very well. What can I do to stay on track? Answer: One year when I was on vacation my wife’s suitcase didn’t make it onto the plane. Compounding the problem was the fact that we were scheduled to take a ferry to our final destination and get on a sailboat charter the next morning. And to top it all off, our final destination was in another country! What a mess. My wife was pretty upset about all of this and it dawned on me as to why. She felt totally powerless to solve the problem that wasn’t her fault at all. Fortunately she had packed some extra clothes in her carry-on, purchased some toiletry items and was able to make do until the bag arrived two days later (we had to sail back to port to pick it up). The lesson here is two-fold. When things go awry we must first and foremost discard any feelings of victimization. Clearly my wife was a victim. The airline screwed up and so did the ferry operator once the suitcase was in its possession. But wallowing in the victim mentality solves nothing (and to be clear, my wife did not wallow). It’s natural to feel a bit helpless in such situations but critical that we move beyond such feelings as quickly as possible. Do you remember the story of “The Little Engine That Could?” I have used this silly childhood story when I have a momentary feeling of helplessness. For me it’s a trigger that helps me get out of the defeated mental state I may be in at the time. Simply saying, “I think I can, I know I can” is enough to start the rally. Once we clear our head the next step in this process is to improvise. My wife didn’t realize it, but she had already begun to improvise when she packed some clothes in her carry-on. Over the years we’ve learned from experience that this is a good idea. For my wife, improvising was not that big of a deal. 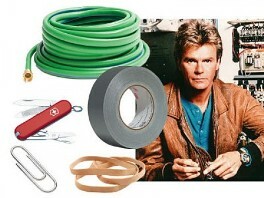 But there are plenty of situations when something goes wrong where we need all of the MacGyver skills we can muster. We step back assess the whole situation. We look around and see what resources we might be able to cobble together that will solve the problem and get us back on track. Our creativity must be called upon at this point. I choose to turn this into a process that I write down on paper. I state the problem in writing; identify the resources in writing and lay out the deployment of those resources – in writing. This is the way my brain works to improvise and solve a problem. We each need find a way that works best for us. This entry was posted in Entrepreneurship and tagged control, creativity, Entrepreneurial Spirit, Entrepreneurs, Entrepreneurship, improvisation, unexpected, victimization by anentrepreneurswords. Bookmark the permalink.